Please provide your phone number so we can call you if there are changes. 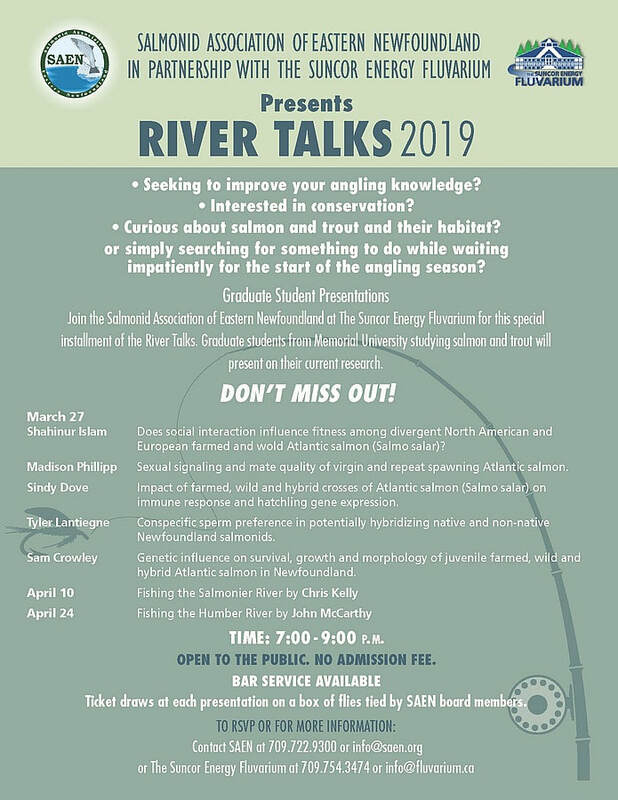 Please select the river talk or talks you are planning to attend. You can select more then one. Number in Your Party (including You) planning to attend this event if known. Join the Salmonid Association of Eastern Newfoundland at the The Suncor Energy Fluvarium for a series of insightful and interesting presentations by SAEN and SPAWN members on everything from where to fish on local rivers to current research on salmon and trout. Five MUN Biology Grad Students; Sam Crowley, Sindy Dove, Shahinur Islam, Tyler Lantiegne, and Madison Phillipp, will present on their current Atlantic Salmon research. Ticket draws at each presentation on a box of flies tied by SAEN board members. ​Admission: Open to the Public. No Admission Fee ! Please RSVP Using the form to the Left. Help SAEN conserve, enhance, protect and educate about our fresh water resources. You can help!